Located at MacDill Air Force Base in Tampa, Florida, the United States Special Operations Command (USSOCOM) oversees all Special Operations Forces (SOF) in the Army, Navy, Air Force, and Marine Corps. Special Operations soldiers are specially trained, equipped, and organized to carry out strategic or tactical missions during periods of war and peace. The units continually train to conduct unconventional warfare in any of its forms, such as guerrilla warfare, special reconnaissance, evasion and escape, subversion, and sabotage. During the George W. Bush administration, SOF missions expanded in size and importance as part of the Global War on Terrorism campaign. The SOF has been increasingly utilized by the Obama administration, and is said to be active in about 120 nations worldwide. This highly specialized wing of the military was implicated in scandals involving a former NFL player-turned-commando and a bribery scheme with defense contractors, as well as reports of secrets missions being conducted inside Iran. Special operations units can trace their origins to the early founding of the country, when they were known as rangers or raiders. America’s first unconventional military force was Rogers’ Rangers, named after Maj. Robert Rogers, who fought during the French and Indian War using hit-and-run tactics. During the American Revolution, Francis Marion, known as the Swamp Fox, led daring guerrilla raids on British forces in South Carolina and Georgia. In the Civil War, Col. John Singleton Mosby became known as the Gray Ghost after leading a band of Confederate raiders who terrorized the Union army by cutting off communications and supplies, wrecking railroads and raiding Union headquarters behind enemy lines. It was during World War II that modern special forces began to take shape through such predecessors as the Devil’s Brigade, Darby’s Rangers, Merrill’s Marauders and the Alamo Scouts. Known formally as the 1st Special Service Force, the Devil’s Brigade was a joint Canadian-American venture that began July 9, 1942, at Fort William Henry Harrison, Montana. Airborne-trained, the Devil’s Brigade saw most of its action in Italy, but also fought in France. Its specialty was close-quarter combat against numerically superior forces. Darby’s Rangers was the moniker given to the 1st Ranger Battalion in honor of its commander, Maj. William O. Darby. The unit was activated June 19, 1942, in Carrickfergus, Ireland. It fought throughout Western Europe, but achieved its greatest fame when it scaled the cliffs of Pointe du Hoc as part of the D-Day invasion of Normandy. Merrill’s Marauders was the title given to Col. Frank D. Merrill’s 5307th Composite Unit (Provisional), a 3,000-man force that fought in Burma. In the Pacific, Lt. Gen. Walter Krueger established a small elite force called the Alamo Scouts, a forerunner of the modern-day Navy SEAL. In perhaps their greatest feat, the Scouts led U.S. Rangers and Filipino guerrillas in an attack on a Japanese prison camp at Cabanatuan, freeing all 511 allied prisoners there. Never numbering more than 70 volunteers, the Alamo Scouts earned 44 Silver Stars, 33 Bronze Stars, and four Soldier’s Medals by the end of the war. Another important lineage from WWII was the Office of Strategic Services (OSS). Considered the predecessor of the CIA, the OSS also performed functions that latter day Special Ops units would carry out. The primary operation of the OSS in Europe was called the Jedburgh mission, which consisted of dropping three-man teams into France, Belgium, and Holland to train partisan resistance movements and conduct guerrilla operations against the Germans in preparation for the D-Day invasion. Other OSS operations took place in Asia, most notably in Burma, where OSS Detachment 101 organized 11,000 Kachin tribesmen into a force that eventually killed 10,000 Japanese at a loss of only 206 of its own. In 1952 the Army created the Special Forces, based at Fort Bragg, North Carolina, trained to infiltrate by land, sea or air enemy-occupied territory and organize resistance/guerrilla fighters to conduct guerrilla warfare. Special Forces were also designed to conduct deep-penetration raids into enemy territory, gather intelligence and carry out counterinsurgency operations. During President John F. Kennedy’s administration, Special Forces became a key player in military operations in Vietnam, where they earned the moniker Green Berets. They also conducted secret missions in Latin American countries, including the capture of Che Guevara in Bolivia. The Vietnam War also marked the founding of the Navy’s and Air Forces’ own version of Special Forces. Responding to President Kennedy’s desire for the services to develop unconventional warfare capability, the U.S. Navy established Navy SEAL Teams One and Two in January of 1962. Formed entirely with personnel from Underwater Demolition Teams, the SEAL mission was to conduct counter guerrilla warfare and clandestine operations in maritime and riverine environments. A year earlier, the Air Force formed the Air Commandos. Following the U.S. withdrawal from Vietnam, Special Forces became less of a priority under the administration of President Jimmy Carter. But with the taking of 53 American hostages in Iran in 1979, Special Forces were called upon to conduct a daring rescue mission codenamed Operation Eagle Claw. The plan was to secretly establish a base of operations in a remote desert region of Iran, slip into Tehran unnoticed, free the hostages and fly out to a carrier task force at sea. The mission failed miserably, as Special Operations Forces (SOF) experienced numerous mechanical problems with their helicopters, causing one to crash and killing eight servicemen. The debacle was an embarrassment for President Carter and the SOF unit. Military hawks argued during the 1980s that something needed to be done to improve the military’s Special Ops capability. Congress adopted legislation in 1987 that established the U.S. Special Operations Command (USSOCOM), with the mission to organize, train and equip SOF units from the Army, Navy, and Air Force. The Marine Corps was added to the command in 2005. Since then the USSOCOM has overseen secret missions in Panama (Operation Just Cause), Iraq (Operation Provide Comfort and Operation Iraqi Freedom), Somalia (Operation Gothic Serpent), Haiti (Operation Uphold Democracy), Kosovo (Operation Allied Force), and Afghanistan (Operation Enduring Freedom), among others. In the wake of the 9/11 terrorist attacks, SOF units grew in size and expanded their missions as part of President George W. Bush’s Global War on Terrorism campaign. SOF units have conducted numerous classified missions in Afghanistan and Iraq, and have reportedly carried out secret reconnaissance operations in Iran. SOF has continued to be an important tool for the Obama administration, which relies on its forces to train allied troops and hunt down terrorists and militants in the Middle East, Latin America, and Africa. As of 2010 there were about 13,000 Special Forces deployed overseas, of which 9,000 were split between Afghanistan and Iraq. Special Forces are said to currently be active in about 120 nations worldwide. The SOF was involved in the capture of former Iraqi leader Saddam Hussein in December 2003, and it was SOF Commander William McRaven who oversaw the Joint Special Operations Command’s Navy SEAL raid that killed Osama bin Laden in May 2011. In September 2009, General David Patraeus signed a secret directive—the Joint Unconventional Warfare Task Force Execute Order—that approved the transport of SOF troops to both friendly and hostile nations in Central Asia, the Middle East, and the Horn of Africa to gather intelligence and establish local military support as preparation for possible military strikes against Iran in the event of escalating tensions over its nuclear plans. In April 2012, the SOF submitted an urgent request to the U.S. Congress and State Department for the authority to extend its training of foreign forces to such nations as Kenya and Yemen, and to expand its operations in Mauritania, Nigeria, Mali, Libya, and elsewhere. The request—which was for a program with a $25 million price tag—was rejected, as it was seen as duplicating the Global Security Contingency Fund, whose $250 million budget was approved the previous year to enable rapid response to emerging threats in many of the same global hot spots. During the 25-year history of USSOCOM, the Army has dominated the leadership of Special Operations Command. The only non-Army officers to lead the command are Air Force Gen. Charles Holland, Navy Admiral Thor Olson, and the current USSOCOM commander, Navy Adm. McRaven. In spite of this, the Army and the SOF have generally remained at arm’s distance, existing within separate cultures based on different modes of training, operation, and public image. That began to change in May 2012, when it was announced that, for the first time, the Army would be placing some of its conventional forces under the direct command of the SOF. Also in 2012, scores of USSOCOM officers joined with the Yemeni military to track and strike targets of Al Qaeda in the Arabian Peninsula. And with most conventional U.S. and NATO troops expected to complete their drawdown in Afghanistan in 2014, the Obama administration explored the idea of transitioning in Special Operations forces to fill the vacuum—a means of addressing security concerns with fewer troops. Special Ops strike teams had already been quietly and increasingly inserted into Afghanistan since 2009—expanding from four to 20 teams, numbering 10 to 100 men each. Between 2011 and 2012 they reportedly carried out thousands of raids, killing about 3,200 insurgents and capturing an additional 8,000. Located at MacDill Air Force Base in Tampa, Florida, the U.S. Special Operations Command oversees all Special Operations Forces (SOF) in the Army, Navy, Air Force, and Marine Corps. Special Operations soldiers are specially trained, equipped, and organized to carry out strategic or tactical missions in pursuit of military, political, economic, or psychological objectives. These operations may be conducted during periods of peace or hostilities. The units continually train to conduct unconventional warfare in any of its forms, such as guerrilla warfare, special reconnaissance, evasion and escape, subversion, and sabotage. Army Special Operations Forces (ARSOF) consists of 26,000 personnel, making it the largest component within USSOCOM. The unit is made up of Special Forces, Ranger, Special Operations Aviation, Psychological Operations and Civil Affairs, as well as Signal and Combat Service Support units. Approximately 1,400 soldiers are assigned to each group. Rangers specialize in light infantry operations. These include attacks to temporarily seize and secure key objectives and other light infantry operations requiring unique capabilities. Like their Special Forces counterparts, Rangers can infiltrate an area by land, sea, or air. The 160th Special Operations Aviation Regiment provides support to Special Operations Forces on a worldwide basis with three types of modified helicopters. The capabilities of the aviation units include inserting, resupplying, and extracting U.S. and Allied SOF personnel. They also assist in SOF search and rescue, and escape and evasion activities. In addition to general aviation support, these units provide airborne command and control, and fire support. Psychological Operations disseminates information to foreign audiences to gain support for U.S. goals and objectives. PSYOP units utilize messages in the form of leaflets, posters, broadcasts, and audiovisual tapes. Each unit has its own intelligence and audiovisual specialists. Civil Affairs units are designed to prevent civilian interference with tactical operations, to assist commanders in discharging their responsibilities toward the civilian population and to provide liaison with civilian government agencies. The 528th Sustainment Brigade, Special Operations (Airborne) enhances medical, maintenance, supply, and transportation capabilities of SOF units. Upon its activation in 2009, this unit took over the 112th Special Operations Signal Battalion (Airborne), which provided communications links and service between the command, joint controlling agencies or commands, and U.S. Army special operations commands in two theaters of operation. Additional components of ARSOF include the U.S. Army Special Forces Command (Airborne), the 75th Ranger Regiment, the U.S. Army Special Operations Aviation Command, 95th Civil Affairs Brigade (Airborne), and the 4th Military Information Support Operations Group. The major operational components of the Naval Special Warfare (NSW) Command include Naval Special Warfare Center plus Groups One, Three, and Eleven in San Diego, California; Naval Special Warfare Groups Two, Four, and Ten in Norfolk, Virginia; and Development Group in Dam Neck, Virginia. These components deploy SEAL Teams, SEAL Delivery Vehicle Teams and Special Boat Teams worldwide to meet the training, exercise, contingency and wartime requirements of theater commanders. NSW consists of approximately 8,900 total active-duty personnel—including more than 2,400 SEALs, 700 Special Warfare Combatant-craft Crewmen (SWCC), 4,100 support personnel, more than 1,100 civilians, and 700 reserve personnel. There are 19 Air Force Special Operations Command (AFSOC) Special Tactics units, called “flights,” distributed among six designations: 1st Special Operations Wing; 919th Special Operations Wing; 352nd Special Operations Group; 353rd Special Operations Group; 720th Special Tactics Group; and 18th Flight Test Squadron. Each flight consists of 18 men, called operators, who are trained in combat control, pararescue, or weather forecasting. Five of the 19 flights are on continuous 24/7 worldwide alert. AFSOC operators are highly skilled in parachuting and underwater and amphibious operations along with small-unit combat tactics. AFSOC units are essentially the Air Force’s only ground combat force that goes beyond ground defense of air bases. In fact, a key job of AFSOC “operators” is to quickly turn an area of hostile terrain into a fully functional airfield. AFSOC units also scout locations for the delivery of 15,000-pound “Daisy Cutter” bombs designed to destroy large areas of enemy territory. The newest of the Special Ops commands, the U.S. Marine Corps Forces Special Operations Command (MARSOC) was launched in October 2005 to form a unit of approximately 2,500 personnel. The MARSOC consists of the Marine Special Operations Regiment (MSOG) and three battalions—the 1st, 2d, and 3d Special Operations Battalions, all headquartered at Camp Lejeune, North Carolina, plus a second MSOG base at Camp Pendleton, California. The MARSOC is divided into three sub commands: Marine Special Operations Support Group, Marine Special Operations Intelligence Battalion, and Marine Special Operations School. Each is commanded by a Marine major and capable of conducting special reconnaissance, unconventional warfare, and counter terrorism, among other functions. The Support Group provides combined arms planning and coordination, K-9 support and communications support, and the Operations School screens, recruits, trains, and assesses Marine Corps candidates for the MARSOC. Activated in 1980 and consisting of highly skilled soldiers, sailors, airmen, marines and civilians, Joint Special Operations Command (JSOC) studies special operations requirements and techniques, ensures interoperability and equipment standardization, plans and conducts special operations exercises and training, and develops joint special operations tactics. Special Operations Command - Joint Capabilities (SOC-JC) is charged with training conventional and special operations joint force commanders and their staffs in the employment of SOF in planning and execution to enhance war-fighting readiness. Like all branches of the military, Special Operations Command relies on defense contractors to provide equipment, weapons, and supplies for Special Operations Forces (SOF) units. However, because it buys specialized equipment for its soldiers, USSOCOM has unique authority to buy materiel without going through the purchasing programs of the Army, Air Force, or Navy. Much of that spending is classified. However, the Military-Industrial Complex website reports that, between October 2006 and August 2012, USSOCOM has spent more than $21.3 billion on such contracts. According to The New York Times, Boeing has received millions of dollars in contracts with Special Operations Command. Boeing is one of the largest defense contractors in the U.S.
Defense contractors also have been known to lavish perks on Special Ops commanders to try to influence their decision-making on procurement matters. A nonprofit organization called Night Stalkers, which provides entertainment and parties for command officials, has listed Raytheon, Boeing, L-3 Communications, Sikorsky, General Electric, and Rolls-Royce as contributors. The contracts with the USSOCOM are valued in the millions of dollars and cover items like lightweight communications systems, ammunition, small arms, and other equipment carried by Army, Navy, and Air Force Special Forces in Iraq and Afghanistan. In July 2013, L-3 Communications was awarded a $500 million five-year contract by the USSOCOM for development and manufacture of satellite systems, and in July it won a $50 million contract for night vision goggles. In August, GATR Technologies was awarded a $37 million contract for inflatable antenna, technical support, and training; and Rockwell Collins was awarded a maximum $45.8 contract for avionics component parts. The consulting firm Strategic Defense International, which represents military contractors, has done business with the command. It also was caught up in a bribery scandal involving its founder (see Controversies). Two Florida businessmen were convicted of fraud in 2012 for lying to U.S. Special Operations Command (USSOCOM) in order to obtain a federal contract for language services. Eduardo Blanchet and Daniel Guillan got started in the federal contracting business in 2002 when their B.I.B. Consulting won a $50 million contract to provide foreign-language instruction for the USSOCOM. But their success eventually meant the business became too big to be considered for more small-business contracts with USSOCOM. So in 2004 they launched a second business, MiLanguages, with a “strawman” president so they could conceal their involvement and they could win another deal worth $100 million. Their actions resulted in being indicted by the U.S. Attorney’s Office in Florida on charges of conspiracy and five counts of wire fraud. The two men were found guilty and sentenced to three years in prison followed by three years of supervised release. The government went after $7 million in their bank accounts, their cars, and other property. The U.S. military deployed its first female engagement teams (FETs) in 2009 consisting of women soldiers assigned to commando units in Afghanistan. The Marine Corps was the first to use FETs, which later became known as Cultural Support Teams (CSTs) once the U.S. Army’s special ops began using women in a similar capacity. The Marine Corps disbanded its CSTs in 2012 following a significant withdrawal of U.S. combat forces from Afghanistan. The work was being taken over by Afghan National Security Forces. Operations Expansion Denied by Congress and State Dept. For much of the Obama administration, the military’s Special Forces seemingly could get whatever they wanted from the White House, which had embraced the capabilities of American commandoes to conduct counterterrorism operations. McRaven had presented the State Department and Congress with an urgent request (stuck into a pending House budget bill) for new authority to train and equip security forces in countries like Yemen and Kenya or places facing their own “Arab Spring” uprisings. The plan was intended to make it easier for Special Ops forces to respond quicker to overseas threats. To the surprise of McRaven and others, lawmakers in the House and Senate and officials in the State Department turned down the request. They instructed the admiral to redo his plan and rely on security assistance programs already in place, including a new one created only a year earlier by Secretary of State Hillary Rodham Clinton and Defense Secretary Robert Gates. During the 2012 presidential campaign, a pro-Mitt Romney political action committee got into trouble for using the logos belonging to the American military, including the USSOCOM. Special Operations for America (SOFA), launched by a former Navy SEAL, criticized President Barack Obama for allegedly taking credit for Osama bin Laden’s death. In its literature, on its Web site, and Facebook and Twitter pages, SOFA featured the logos used—and trademarked—by the Army, Navy, Air Force, and the USSOCOM. Pentagon officials contacted the SOFA and instructed the group to cease using the trademarks, citing military regulations forbidding the branches of the armed forces from endorsing candidates or political campaigns. Coming off its successful mission that killed Osama bin Laden, the USSOCOM sought to expand its authority by getting permission to train and equip security forces in countries with terrorist groups, like Yemen and Kenya, for counterterrorism purposes. USSOCOM commanders argued the intent was to streamline efforts to thwart foreign terrorist threats. The request included money to create, train, and equip domestic special operations troops in such nations. But Congress and the State Department rejected the proposal in 2012, with some claiming the plan would have led to the circumvention of the regular chain of command. A Pentagon official said the request was brought forward in an open and transparent way. The State Department disapproved of the idea because it had a similar program, the Global Security Contingency Fund, set up in 2011 by Secretary of State Hillary Clinton and then-Secretary of Defense Robert Gates, which officials said USSOCOM should be working with. A year after the raid that killed Osama bin Laden, critics of the Obama administration accused officials of compromising sensitive information from the mission by sharing it with Hollywood filmmakers. Judicial Watch, a conservative watchdog group, said it obtained documents through a public records request that appeared to show film director Kathryn Bigelow and screenwriter Mark Boal were given access to a Central Intelligence Agency secret room and allowed to meet with a Special Ops raid planner about the bin Laden mission. Bigelow and Boal worked together on the Oscar-winning movie The Hurt Locker and later made Oscar-nominated Zero Dark Thirty, an account of how the U.S. took out the head of al-Qaeda. Col. Tim Nye, media specialist for the USSOCOM, asserted the command would not have agreed to collaborate with the filmmakers. Besides, he said, Adm. William McRaven, with Special Operations Forces, wouldn’t get involved in such a project. McRaven was in charge of forces that took part in the raid and, if he did, a movie on the subject would end up being about him. 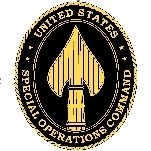 During its expansion as a key counterterrorism weapon, and especially since September 11, 2001, the USSOCOM’s component group, the Joint Special Operations Command (JSOC) has become involved in assassinations, counterterrorist raids, long-range recon, foreign troop training, secret prisons, and more, according to former military advisers and media reports. In addition, JSOC operates a network of secret prisons—as many as 20 black sites in Afghanistan alone—which are used for interrogating detainees. Some of these sites are being handed over to the Afghans as the American forces pull out. Special Ops Forces Entered North Korea? U.S. Army Brig. Gen. Neil Tolley, commander of U.S. Special Operations in South Korea, stirred controversy in May 2012 by indicating that American and South Korean soldiers have snuck into North Korea on spy missions. Freelance reporter and technology writer David Axe said Tolley spoke of the missions as though they were still happening, and not just in the past. The following month the Pentagon announced that Tolley was being replaced as head of Special Ops in South Korea. Defense officials said the decision had nothing to do with the general’s earlier remarks. The U.S. Special Operations Command (USSOCOM) denied media and Web site reports of military drones flying over U.S. airspace in 2012. The Web site Public Intelligence published a map of current and proposed Department of Defense drone activities within the U.S. that showed unmanned aerial vehicles operating over New Hampshire and Oregon. This news prompted newspapers in both states to investigate and contact the USSOCOM about the drone missions. A Command official said Public Intelligence’s information was inaccurate, while the Web site claimed two U.S. senators confirmed the flights. In the case of both states, the flights involved the Wasp and Raven surveillance drones. In March 2013, in a rare show of bipartisanship, Congress called for the development of rules for the unmanned craft that would safeguard Americans’ privacy and regulate data collection and disclosure. Civilians working for defense contractors have helped operate drones for the U.S. military, including missions conducted by Special Operations, even though federal policy prohibits their involvement in some types of missions. Some dozen contractors, it turns out, fill the void because of military staffing shortages. In 2010, an investigation into a controversial drone attack in Afghanistan revealed that an employee of SAIC had overseen other analysts at Air Force Special Operations Command at Hurlburt Field in Florida as the unmanned aerial vehicle (UAV) tracked suspected insurgents near a small unit of U.S. soldiers. The contractor’s analysis played a role in an Army captain’s order to launch an airstrike on a convoy that turned out to be carrying innocent men, women and children. Fifteen Afghans died. In 2013, a media investigation by Nouse, the student newspaper of the University of York in England, revealed that BAE (York, Pennsylvania), a drone research sponsor, was employing civilian contractors to fly drones for military operations in Afghanistan. The drones in question were smaller UAVs known as the Manta and Silver Fox. Nouse had obtained documents from the U.S. Office of Federal Procurement Policy that underscored the fact that the Air Force must “prohibit mission performance by contractor personnel” of small, unmanned vehicles and that use of civilians to operate them violates policy. In a scandal at the United States Special Operations Command, federal investigators examined a bribery scheme as well as accusations of improper influence involving millions of dollars in battlefield equipment used by Navy Seals and Army Green Berets and Rangers. The investigations examined the hiring of a former Special Operations Command official by a military contractor as well as financial contributions by military contractors to a nonprofit organization that ran social events for the Special Forces. Among those under investigation was Gen. Bryan Brown, who headed the command until July 2007. A civilian procurement official at the command, William E. Burke, pleaded guilty in federal court to having accepted bribes from an individual who represented military contractors seeking to equip commandos. The Special Forces command also investigated all of the contracts handled by Burke since 1999 to see whether Special Forces troops received inferior equipment as a result of the kickbacks. As a result of the scandal, the Pentagon began looking into accusations made by current and former employees that a former military procurement official who oversaw millions of dollars in Boeing Company contracts went to work for Boeing after leaving the command. In January 2005 investigative journalist Seymour Hersh reported in the New Yorker about the George W. Bush administration’s expanded use of covert military operations, including missions inside Iran as part of preparations to attack the longtime U.S. adversary. Hersh said secret reconnaissance missions, most likely involving Special Ops units, had been taking place inside Iran at least since the summer of 2005. Much of the focus was on the accumulation of intelligence and targeting information on Iranian nuclear, chemical, and missile sites, both declared and suspected. The goal was to identify and isolate three dozen, and perhaps more, such targets that could be destroyed by precision air strikes and short-term commando raids. “The civilians in the Pentagon want to go into Iran and destroy as much of the military infrastructure as possible,” a government consultant with close ties to the Pentagon told Hersh. The story also told of an American commando task force that had been set up in South Asia, and with the aide of Pakistan, had been penetrating eastern Iran from Afghanistan in a hunt for underground installations. The task-force members used remote detection devices—known as sniffers—capable of sampling the atmosphere for radioactive emissions and other evidence of nuclear-enrichment programs. Furthermore, according to Hersh, under new anti-terrorism strategies pushed by the administration, Special Ops units had been set up into “action teams” in the target countries overseas to find and eliminate terrorist organizations. In mid-2009 under the Obama administration, the USSOCOM formed a new elite commando team that it put into operation in the Persian Gulf. Known as Joint Special Operations Task Force-Gulf Cooperation Council (JSOTF-GCC), the team counsels allied Arab military forces that view Iran as a threat, and serves as a military option for the U.S. during a time of rising tensions with Iran. A secret seven-page directive written by Gen. David Petraeus authorizes teams of Special Forces to engage in spying missions inside Iran to pave the way for a military strike on the country in the event President Obama orders it. Following the death of Osama bin Laden, a former Navy SEAL published a book claiming to tell the “real” version of the operation, while bashing the Obama White House role and account. In SEAL Target Geronimo, Chuck Pfarrer accused the administration of issuing a fictional telling of the raid that made the SEALs looks bad. He also said President Barack Obama quickly announced the success of the raid in order to score political points. Pfarrer also insisted that the stealth helicopter that reportedly crashed during the mission actually crashed later, and that the SEALs were able to launch their raid without any problems. The controversial claims elicited a response from the U.S. military, which denounced Pfarrer. “It’s just not true,” U.S. Special Operations Command spokesman Col. Tim Nye told the media. “It’s not how it happened.” And, Nye also stated that, despite Pfarrer’s claims, the author had nothing to do with planning, executing, or officially analyzing the mission. A former Army Special Forces medic who worked as a civilian at the USSOCOM was convicted of 17 bribery counts in 2011. Joseph Marak took more than $14,000 in bribes and gratuities while working for the Command and another $350,000 after he left the job in 2006. The bribes came from Special Operations Technologies and Skedco, companies Marak worked with to develop first-aid “litter kits” for use in evacuating wounded personnel from rugged terrain. He was ordered to pay more than $350,000 to the government and sentenced to six years in federal prison, but he could have gotten 15 years for each count. In September 2010, U.S. Special Forces participated in a targeted airstrike intended to kill a leader of the Taliban in Afghanistan. Following the mission, the U.S. claimed success, while an independent group said the attack only killed civilians. Taking place on the morning of September 2, the attack focused on a convoy of six vehicles crossing a remote mountain range in northern Afghanistan. An F-16 fighter plane and an American helicopter struck the cars with bombs and gunfire, killing ten people and injuring seven others. The U.S. claimed the attack killed its target, Muhammad Amin, the deputy governor of Takhar and a leader of the insurgency. But after an eight-month study, the Afghanistan Analysts Network issued a report disputing this claim, saying a former Taliban commander, Zabet Amanullah, who had laid down his arms in 2001, was killed, not Amin, along with other noncombatants who were election campaign workers. The U.S. claimed that Amanullah and Amin were one and the same. Following the 9/11 attacks, NFL star Pat Tillman did the unheard of. He walked away from a million-dollar career playing pro football in order to enlist in the Army. Wanting to fight al Qaeda and capture its leader, Osama Bin Laden, Pat Tillman wound up serving in the Army Rangers along with his brother, Kevin. Pat Tillman’s enlistment grabbed the attention of the nation—and the highest levels of the George W. Bush administration. A personal letter from Secretary of Defense Donald Rumsfeld thanked him for serving his country. Instead of going to Afghanistan, as the brothers expected, their Ranger battalion was sent to participate in the U.S.-led invasion of Iraq in March 2003. The Tillmans saw combat several times on their way to Baghdad. In early 2004, they finally were assigned to Afghanistan. Tillman’s killing was widely reported by the media, including conservative commentator Ann Coulter, who called him “an American original—virtuous, pure and masculine like only an American male can be.” His May 3, 2004, memorial in San Jose drew 3,500 people and was nationally televised. A U.S. Army report, plus additional transcripts and investigative documents, disclosed that U.S. soldiers on the scene knew instantly that Tillman had been killed by friendly fire, and that the first Army investigator knew within days of his death that he had been shot by fellow soldiers. High-ranking Army officials, including theater commander Gen. John P. Abizaid, were also aware of this information days before Tillman’s funeral service. In spite of this, official reports of Tillman’s death claimed that he was killed by enemy fire, and critical evidence was destroyed. In fact, in 2007, the theory was floated that Tillman wasn’t killed by “friendly fire.” He may actually have been assassinated because he was about to become an embarrassment to the administration by urging other soldiers to vote for John Kerry, the Democratic candidate, in 2004, or that he was going to come home denouncing the war and America’s role in it. The USSOCOM staff was encouraged during the event to pursue innovative ideas and integrate pioneering ideas into their operations. One example cited was a new crowdsourcing and collaboration function called SOFBOX, which allows personnel from any level to deliver their ideas to senior leadership. The ability to develop new assets is dependent on money, and even with the USSOCOM’s sterling reputation and support from the White House, the special military branch was facing a steep cut in funding, possibly as much as $1 billion over five years beginning in 2014. Nonetheless, the USSOCOM was not planning a reduction in its forces, which was expected to reach 70,000. For much of the decade following September 11, 2001, the USSOCOM had no trouble expanding its budget, which soared from $3.5 billion to $10.5 billion during those years. Linda Robinson, adjunct senior fellow for U.S. national security and foreign policy at the Council on Foreign Relations, testified before the House Committee on Armed Services Subcommittee on Emerging Threats and Capabilities in 2012 to discuss how Special Operations Forces (SOF) could be restructured to better confront global challenges. Establish more flexible combinations of SOF and conventional forces to enable the SOF to operate in more places or at larger scale. Should targeted killings be allowed? Following the terrorist attacks on September 11, 2001, the United States began using targeted killings as a tactic to pursue those responsible. In time, the policy expanded to include others deemed a potential threat to the nation, but who hadn’t been involved in the 9/11 attacks or other terrorist missions against the U.S. The Department of Defense and the Central Intelligence Agency have been responsible for carrying out targeted killings in Afghanistan and Iraq, as well as in Pakistan, Yemen, and Somalia. Targeted killings have escalated and increasingly involved the use of unmanned drones during the Obama administration. The George W. Bush administration practice of using U.S. Special Operations forces to carry out kill/capture missions has also continued. The successful killing of Osama bin Laden by Navy SEALs in May 2011 and the September 2011 drone strike on Anwar al-Awlaki, an American-born Yemeni cleric and al-Qaeda member, are examples of this policy. The White House has argued targeted killings are necessary and deemed them successes of foreign policy, while critics have condemned the tactic on moral, legal, and political grounds. The Obama administration has argued that targeted killings are legal under U.S. law. Furthermore, officials have labeled them as ethical and wise, because the attacks are done with precision that effectively takes out threats to the U.S. while avoiding civilian casualties. This tactic also prevents future attacks on the country by weakening adversaries like al-Qaeda and sending a message to other would-be dangers that the U.S. will respond if threatened. Others in support of the administration’s policy point out that drones allow the military to put fewer American soldiers in harm’s way. From an economic standpoint, drones are also a good idea because they cost considerably less than manned aircraft to produce. Opponents of targeted killings object to them for moral, legal, and political reasons. Morally, it makes no sense at all for the U.S. to conduct what amounts to assassinations, taking away any ethical high ground to stand upon. Killing individuals, even suspected terrorists, without due process is anathema to the American way and our system of jurisprudence, critics say. Also, targeted killings have turned out to be anything but precise. Again and again reports have surfaced of so-called surgical missions turning out to be blunders that cost numerous civilian lives, which have poisoned opportunities for the U.S. to win over local populations. This Joint Unconventional Warfare Task Force Execute Order was signed by Petraeus which was in 2009 commander of CENTCOM and not SOCOM, so it would eventually just affect the SOCCENT. Gen. Raymond A. “Tony” Thomas III, a long-time member of the special operations community, was appointed to command the U.S. Special Operations Command on March 30, 2016. Thomas was born in Philadelphia on October 6, 1958. He went to the U.S. Military Academy at West Point, graduating in 1980 with a commission as a second lieutenant. Thomas later earned an M.A. in international studies at the Army War College and an M.S. in the same subject at the Naval Command and Staff College. Thomas was initially with a mechanized infantry unit but soon transferred to the Rangers. He made a combat jump into Grenada in 1983 and another, six years later, into Panama. Thomas then joined Delta Force, the Army’s elite special operations unit. He served as troop commander, squadron operations officer, unit executive officer and squadron commander with Delta Force. In 2000, Thomas took over as commander of a Ranger battalion without having served as a regular infantry battalion commander first, a break with tradition. He took his unit to Afghanistan three months after the 9/11 attacks and, from 2001 to 2013, spent part of every year except one in Afghanistan. Thomas was made director of operations and chief of staff of the Joint Special Operations Command in 2003. He moved over to the 1st Armored Division as assistant divisional commander in 2007, serving 15 months in Iraq. While there, he survived a car-bomb attack on his armored vehicle. Thomas was moved to Washington in 2009 as deputy director for special operations for the Joint Chiefs of Staff. The following year, he was made deputy commanding general at Joint Special Operations Command and in 2012 was named commanding general of the Special Operations Joint Task Force—Afghanistan/NATO Special Operations Component Command. In 2013, Thomas went to work at the Central Intelligence Agency as its associate director of military affairs. The following year, he took over as commander of the Joint Special Operations Command at Fort Bragg, N.C., the unit that oversees secret counter-terrorism units including Delta Force and the Navy’s SEALS. He was in that post until being given Special Operations Command. Thomas has a reputation of being a straight-talker and inspiring loyalty from those he commands. He’s known for giving subordinates a copy of “Gates of Fire,” a novel about the last stand of 300 Spartan hoplites at Thermopylae, and discussing it with them during five-mile runs. Thomas and his wife, Barbara, have two sons, both graduates of West Point. The mastermind of the raid that killed terrorist Osama bin Laden has served since August 8, 2011, as commander of the highly secretive United States Special Operations Command (USSOCOM), headquartered at MacDill Air Force Base in Tampa, Florida. USSOCOM ensures the readiness of joint special operations forces and, as directed by civilian authority, conducts operations worldwide. At present, U.S. Special Forces are said to be active in about 120 nations worldwide, where they conduct assassinations, counterterrorist raids, long-range reconnaissance, intelligence analysis, foreign troop training, and weapons of mass destruction counter-proliferation operations. 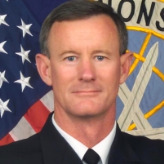 Born November 6, 1955, in San Antonio, Texas, William McRaven graduated from Roosevelt High School in 1973 and earned a B.A. in Journalism from the University of Texas at Austin, which he attended on a track scholarship, in 1977. The military life was in his blood, however, as his father, Colonel Claude McRaven, was an Air Force colonel who flew British Spitfires during World War II and played two seasons for the Cleveland Rams of the NFL. Bill McRaven chose the Navy for his career, first in the Navy ROTC program in college and then as a career Navy officer. In 1991, he was assigned to the Naval Postgraduate School, where he earned a Master’s Degree with a thesis titled, “The Theory of Special Operations.” He also helped establish, and was the first graduate of, the Special Operations/Low Intensity Conflict curriculum. Upon graduation from UT in 1977, McRaven married his college sweetheart, Georgeann Brady, signed up for Navy SEAL training and deployed to the Philippines. Although he was fired in 1983 from his position as squad commander at the Navy’s new Naval Special Warfare Development Group, McRaven’s career continued on its upward trajectory, and he won a chance at platoon command in SEAL Team Four. From then onward, he moved steadily up the ranks, through various command and operational roles, including task unit commander during the Persian Gulf War; task group commander in the U.S. Central Command; commander of SEAL Team Three; and commodore of Naval Special Warfare Group One. In 2001, however, McRaven sustained serious injuries during a parachute jump, and had to sit on the sidelines in the months immediately after the September 11, 2001, terrorist attacks. While recuperating, McRaven served at the National Security Council as the first Deputy National Security Adviser for Combatting Terrorism, where he was the principal author in 2006 of the government’s National Strategy for Combating Terrorism. Returning to more active duty even before that document was published, McRaven engaged in numerous special operations, all of which are shrouded by the veil of government secrecy. McRaven was promoted to high command in 2006, serving in Stuttgart, Germany, as commander of the Special Operations Command Europe from June 2006 to March 2008. He was also named director of the NATO Special Operations Forces Coordination Centre, where he was responsible for improving NATO Special Operations Forces. He was promoted again in June 2008, when he took over as the commander of the Joint Special Operations Command (“JSOC”) headquartered at Fort Bragg, N.C., where he remained until June 2011. At JSOC McRaven greatly increased the frequency of raids in Afghanistan, Iraq and elsewhere, which were often carried out at night and caused controversial civilian deaths, leading McRaven to order the use of bright-white spotlights on AC-130 gunships during nighttime raids to minimize casualties. In 1996, he published a book, based on his M.A. thesis, titled Spec Ops: Case Studies in Special Operations Warfare: Theory and Practice. McRaven is a qualified diver, parachutist, demolition expert and submersible pilot.